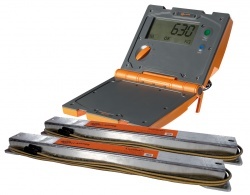 This is an excellent value livestock weighing kit, from Gallagher. The W210 weigh scale has an internal rechargeable battery and a simple rotary selector knob, with three weighing modes for quick and easy weighing: auto, manual and fine. The scales work, even if the animal is moving. It has a tough waterproof case and is compatible with most loadbars. This kit is very popular with farmers looking to take advantage of some of the grants currently available. Up to 40% of the purchase price can be claimed. For further details, have a look at the following grant options.